When I looking for journal writing inspiration, I sometimes read the humorous, quirky, and often insightful diary entries of David Sedaris. Published in 2017, Sadaris’ Theft by Finding: Diaries (1977-2002) is a hefty 529 pages of selected diary entries. The famous author admits you probably won’t read the book from cover to cover, and that’s true. I read most of the tome, but more importantly I started emulating his detailed observational style of writing. There is nothing in his diary entries that the National Enquirer would be interested in, but it’s the way Sedaris describes what he sees that is entertaining and creative for journal and diary writing. While waiting for K to get done with his piano lessons, I watched at least ten people walk down the stairs from what must have been a doctor’s office. One man stood at the foot of the stairs puffing on a cigarette. A short woman maybe in her fifties wearing a grubby beige jacket held tight onto decaying wooden rails her head bent down looking at her feet as she took one careful step at a time, while the smoking man at the end waited for her. Standing at his side and holding onto his shoulder was a younger woman with red hair and Down syndrome. If nothing else, a diary teaches you what you’re interested in. My journal entry is not a vignette. It has no beginning, and no ending. But it is a snapshot of a brief moment in my life. Sedarias’ diaries are mostly short observations without an ounce of reflection or introspection. But what he chooses to write about says a lot about him, his interests, and his values. As I was putting together this article, I discovered there’s a compendium book of David’s diaries filled with including interactive components, postcards, and never-before-seen photos and artwork. Click on the image to view the product page on Amazon. We don’t have to be a famous author to make a list of our own list of reasons for living, or our list for what makes us happy. It’s simply a list, but I assure you it will make you think about what’s important to you and what you value. 1. Conversations with my young adult children. 2. Visiting my daughter’s apartment in New Haven. 3. Writing my second book. It’s a rare treat when someone allows their journals to be published, and though parts of Sedaris’ collection are little redundant or drag along, his diary entries will definitely inspire you to write more creatively and not take for granted or overlook the people you encounter and the family members with whom you share your life. A elderly white man stopped me in the grocery store today and asked for my help with what was probably an iPhone 4. He mumbled that he couldn’t get a Wi-Fi connection as he showed me his phone while swiping on the screen. I explained that he needed a LTE connection, and I showed him the LTE icon on my phone. He nodded his head okay, and then I had him tap on the Settings app of his phone.I told him to tap the Celleur button to get Wi-Fi. I started to explain what LTE is, but it didn’t matter. He located the Uber app and slowly walked off without saying thank you. Oh well. 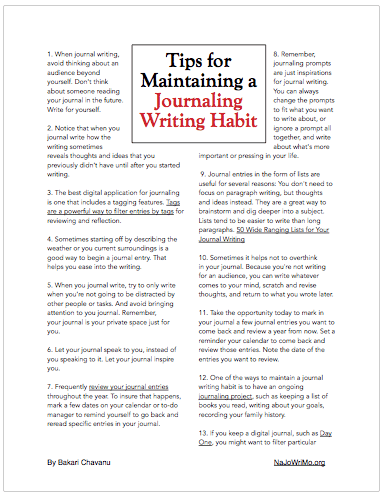 Here’s a few observational writing prompts for your journal writing. Try to focus on observations and experiences that occurred the same day or the day before. If you’re not used to writing observational diary entries, try doing so for an entire week or two. Write in dialogue form a conversation you had or overheard. Look out your window and describe what you see. Take your journal to a coffee shop and describe what you see or hear. Describe a recent party you attended. Describe your most recent sexual experience. If you attend church, describe a part of the minister’s sermon and how people reacted to it. Copy an interesting tweet, Facebook post, or text message. Describe something interesting you watched on a reality TV program. Described what you do when you get your next paycheck. Describe something one of your one of your children or grandchildren says. If you are inspired to do so, I invite you to share your comment about observational diary writing, and if you don’t mind, please share a short entry of one of your diaries. Diaries and journals are very personal, but it’s always a treat to read what others have written.